Hi Everyone! 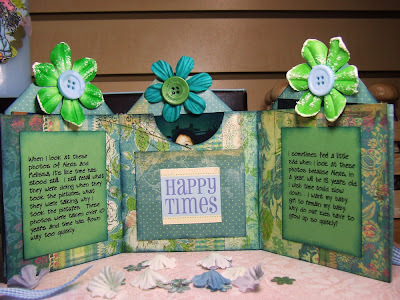 Here is the tutorial on the 4x4 Mini Tri-Fold Album that I promised to create. 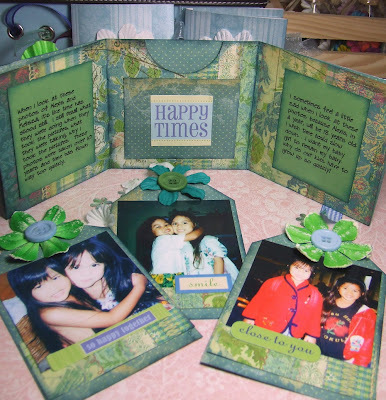 Like yesterday's mini album, this project was inspired by Jana of 2 Worlds mini tri-fold album. I decided to create a "larger" version of the album with a few modifications. Her tutorial includes acetate while my album do not. Click here for Jana's version. I'm in the process of creating a written version of this tutorial for those who are on dial up or have slow Internet service. Gosh, are people still using dial up? Isn't it a bit archaic to have dial up these days! LOL! I've been using cable since 1996 so dial up seems a bit primitive to me! The actual size of the album with the tags are 4 x 5". Without the tags, the album & pockets measure 4 x 4". I finally worked on a "video" tutorial. Argghh, it was painful. I haven't been creating video tutorials because my computer is running so sluggish that it can't handle super large files like videos. Luckily, today my computer behaved. Wish it would behave all the time. Anyway, here is the album opened up to the first panel. I decided to do a bit of journaling. I, again, messed up on my journaling. I forgot to proofread it and realized that my brain was thinking faster than my typing. LOL! I decided to leave it as is because well, it's part of who I am. . .my brain is always churning where the rest of me can't keep up. Ha! This is the album with the panels opened up and the tags inside the pockets. 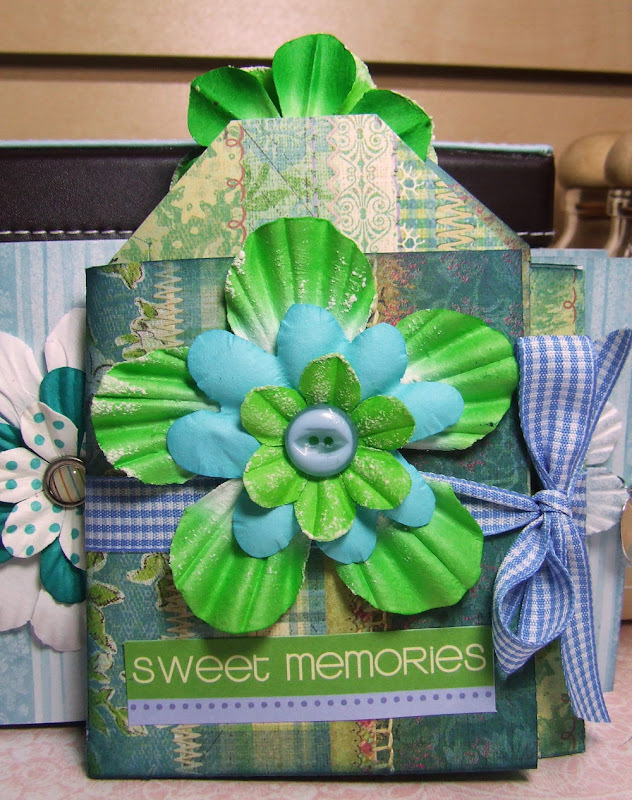 Rather than using ribbons for the tags, I, again, used prima flowers. I love primas. . .I can't get enough of them!! They are sooooo pretty. Do you see the buttons? Well, they are the buttons that Mel of Mel Stampz sent me a few weeks ago. I love the buttons that she sent me. I'm big on buttons right now and she sent me a whole bunch! Whoohoo! Thanks Mel. . . Okay, here are the tags out of their pockets!! The tags measure 3 1/4 x 5". 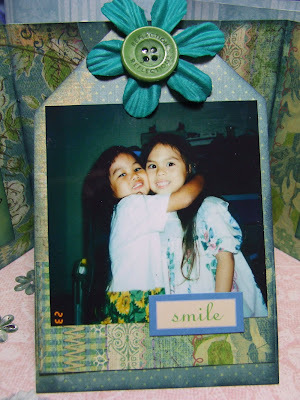 The pictures on the tags are of my daughter when she and her cousin were 5 and 6 years old. Gosh, they are so cute. They used to be really close but since we've moved to California, well they've grown apart somewhat. It's a little sad. Awww, this is my favorite photo of them together. This picture says it all! They really were that close. . . .like sisters. This picture was taken on my daughter's first trip to Disneyland. Sadly, I couldn't experience the trip with her because I was in college and couldn't take the time off. Luckily, she had her cousin to enjoy Disneyland!! Anyway, check out the tutorial! Tell me what you think! 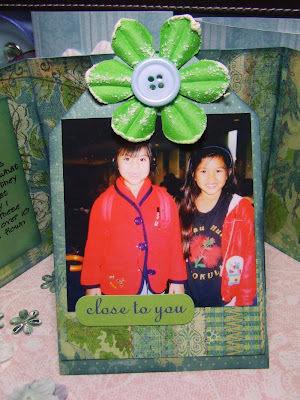 Accessories: Prima Inc. buttons from Mel, K&Co stickers, Basic, Basic Ribbon. Thank you for the tutorial! Now, I have an idea of what to make for my Dad's birthday next month. I am going to make a tri-fold album of the grandkids. Thank you! You make it look oh so easy! Great tutorial Maria. Very clear instructions and even I could do it!! thank you. It was so nice to hear your sweet voice also. Great version Maria, its so cute ! 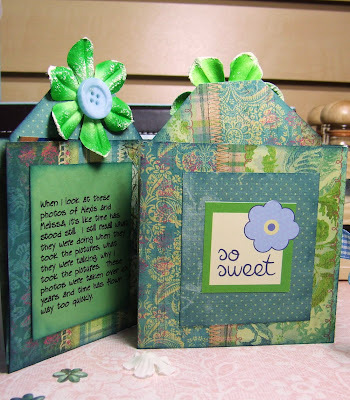 Wow, I didn't realize how easy it was to make these, I have to give it a try soon! Thanks so much for doing the tutorial, you did a fantastic job! Luv that album & the colors, the pictures are so cute, if only we could freeze time, I feel the same as you, they grow up too fast!!! Your mini album is awesome Maria! I love all the details and your pictures are beautiful and TFS the tutorial!!! !